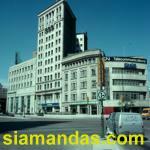 What do I think of the closure of Portage and main; I hate it! NAR: The closure of Portage and Main to pedestrians has raged in controversy for 25 years. Without pedestrians crossing Portage and Main it lost something. A number of people said that when they put the barriers up you took away the heart of Winnipeg. In cities that feel vibrant you see the people on the street. When you take them off the street it looks empty. I personally feel Portage and Main should be opened its perhaps the great intersection in Canada. There is no question about it is the one icon of Winnipeg that is known more than any other place or location. I think there are points at which traffic flow of vehicles ought not to be the deciding factor of the character of a place. Where there is a will there is a way. When they put the barricades up at Portage and Main it was part of an urban planning trend to try to move traffic in and out of the centre of the city faster. What I think experience has shown in the re-energization of downtown, is actually, congestion works better. It makes people feel safer and downtowns aren't freeways. My view is that we should reopen the intersection to pedestrian traffic and bring people back up above ground. With the opening of the concourse we needed to be where the traffic was. Our customers said we don't like it down there; we don't like to bank underground. We want to go upstairs so we made a decision as a company to listen to our customers; we moved back upstairs. NEW NAR: Plans are underway to reopen the corner to pedestrians and to find ways to celebrate the corner. Only one building owner is opposed. NAR: Something has been lost. Portage is no longer a people street. Eaton's, the big store, is gone, and there is talk, that the last remaining big downtown store, the Bay, will soon be cut down from its 6 floors to 2. Or maybe even leave downtown forever. Some have given up on Portage Ave. Afraid to go downtown. They complain about the lack of parking, the panhandlers, and the street people, the empty storefronts and barren sidewalks. They see a growing wasteland.